Irene Trowell-Harris vividly remembers the day her life changed. One of 11 children who grew up on a small farm in Aiken, S.C., she worked the cotton fields with her family. One day, she looked up and saw an airplane. “I said that someday I was going to be up there, teaching and working in an airplane. I never even knew anyone who had been in an airplane but I just wanted it so much,” she recalls. After earning her undergraduate degree at Jersey City State College (now New Jersey City University; she was awarded an honorary doctorate by NJCU in May), she finished nursing school and went into the military to become a flight nurse. 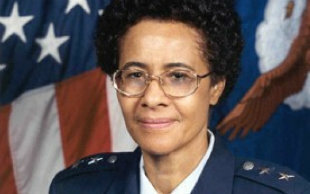 She served 38 years in the U.S. Air Force/Air National Guard, becoming the first Black woman to be promoted to general officer. Now retired, she continues to focus on helping others, remembering her own remarkable journey. Irene’s told this story many times but it’s a lesson in the good of philanthropy that bears repeating. While she was still in high school in South Carolina, she mentioned one Sunday at church that she hoped to go to nursing schoola rarity for a poor, Black girl at that time. The church immediately took up a collection and raised $60 in nickels and dimes, enough to help send her to school. “I want young people to understand that no matter where they are coming from, they too can be successful. They have to really focusand stay in school,” she says. Since her earliest days, Irene has mentored others. She works with the Tuskegee Airmen (and is the only woman to have had a chapter named after her) to get young people into flight school. And she gives scholarships to the very church that helped her so many years ago. “I’ve been working for every institution that touched me when I was coming along to get scholarships for low-income students. I’ve been donating my entire career,” she says, noting that Columbia University named a scholarship after her and that she’s been actively involved in establishing scholarships for nursing students. Irene’s career is so remarkable because of all the barriers she broke in the military as a woman and as a Black woman. “I wanted to serve my country because I had two uncles in the Army in World War II,” she recalls. The military has changed dramatically since she started. She notes that until 1967, the military had a ceiling that only 2 percent of the armed forces could be women. From 19691972, the reserves opened up considerably for women and people who weren’t white, she says. The issues of quality of life and family demands for women were top of mind for her, as she served on numerous high-level committees and worked with the Department of Veterans Affairs to improve women’s experiences in the military. “When I first started, if a woman became pregnant, she had to get out of the service,” Irene recalls. Today, she sees the greatest challenge to a military career for people from all underrepresented groups as not having the right qualifications, both educationally and personally. “The military wants college-educated people in good health, who are not overweight, with no history of any criminal problems. Once you get in the military, you are required to maintain the weight status and perform your job with excellence. It’s a strict culture with all different kinds of regulations,” she says. She advises young people entering the military “to think before you speak and don’t put your career in jeopardy.” She recalls her own mentors, a flight nurse and a base commander, both white. The man, General Paul Weaver Jr., former Director of the Air National Guard, “let me know the politics of the military.” He also sponsored her, recommending she become a lieutenant commander and that she pursue her education. For now, she’s encouraging nurses to think about leadership and advocacy, working with veterans and writing her second book of memoirs. “I want to help and touch as many people as I can in my life,” she says.